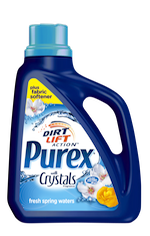 Purex plus Fabric Softener and Crystals fragrance has the same great quality as other Purex products. The Dirt Lift Action assures you that your clothes will stay bright, white and clean! It's funny because I really am a big fan of making my own laundry soap. It's easy, inexpensive and a great skill to teach the kids. But even so, there are times when I like to have a bottle on hand of store bought soap. Purex is a perfect fit for us because it is inexpensive compared to other brands yet it works great! 3 BOTTLES OF PUREX WITH CRYSTALS! Disclaimer: Purex Provided me with a free sample of Purex with Crystals for the purpose of this review. All opinions expressed here are my own.